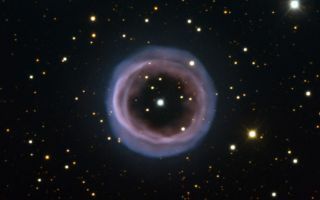 The hazy and aptly named Fine Ring Nebula, shown here, is an unusual planetary nebula. Planetary nebulae form when some dying stars, having expanded into a red giant phase, expel a shell of gas as they evolve into white dwarfs as seen in the stunning space wallpaper. Most planetary nebulae are either spherical or elliptical in shape, or bipolar (featuring two symmetric lobes of material). But the Fine Ring Nebula — captured here by the ESO Faint Object Spectrograph and Camera mounted on the New Technology Telescope at the La Silla Observatory in Chile — looks like an almost perfect circular ring. Astronomers believe that some of these more unusually shaped planetary nebulae are formed when the progenitor star is actually a binary system. The interaction between the primary star and its orbiting companion shapes the ejected material.